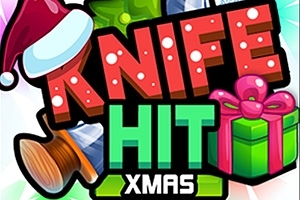 Aim your throwing knives at the presents, baubles, and Christmas dishes spinning around in the middle of the screen in the skill game Knife Hit Xmas. Avoid the knives already pinned into your target, or your own knives and skewers will be deflected. In the lower left-hand corner of the screen, you'll see a countdown for the knives you have to stick into each target. Can you reach the desired total without making any mistakes? Try to collect the green diamonds to save up for new sets of throwing knives. All the targets and some of the knives have a fun Christmas theme to get you into the mood for the festive season!